Varanasi, or Banaras, is the spiritual capital of India. Located in the state of Uttar Pradesh on the banks of the river Ganga, the city holds a very important place in the history as well as today’s world. Arguably, Varanasi is the oldest city of the world which is continually inhabited. Mythologically speaking the city was established by Lord Shiva himself along with other six cities. Archeological evidence shows that the city traces back its existence to as far as 2000 BCE. The city is mentioned in the epics like Mahabharata and Ramayana. The ancient scriptures of Vedas also have the mention of the city which itself is around 2000 BCE old. The recent archeological advancement shows that the city was the hub of business during the pre-historic era. Post-Independence, the city shows nominal growth in setting up new industries. The site is world heritage and is preserved by the authorities. Though, the place is a major tourist attraction, it has business model, which supports the economy of the city. Undoubtedly, the tourism sector is the biggest contributor to the economy of Varanasi. It attracts people from all over the planet, round the year. The tourism market is never down and is evergreen sector. The place holds a great importance in Hinduism and Buddhism. It is believed that taking bath in Ganga river, in Varanasi will earn Moksha or salvation from the cycle of birth and death. Hence, people from all sect and status come here to visit the place round the year. The temple of Kashi Vishwanath, is also among the most visited place of the city. People from all over the world, belonging from different religion comes to witness the culture and tradition of the city. This brings the opportunity of hospitality business. The hotels and resorts does pretty good business during the seasons. 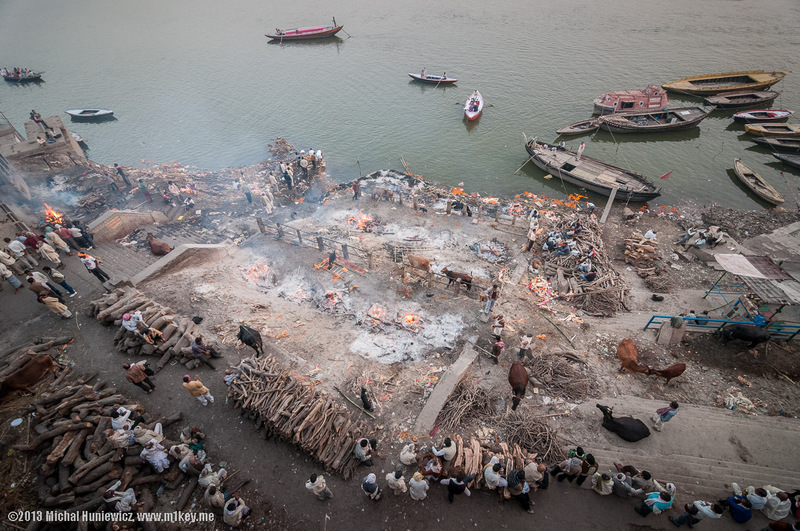 Major tourist attraction includes The Dashashwamedh Ghat, which is the oldest ghat of Varanasi, just beside the main temple, and The Manikarnika Ghat which is the major cremation place of Hinduism. The cremation service is also a big business now-a-days. People take a lump-sum money to perform the last rituals. With the presence of hub of tourist attraction, the crafts industry grew rapidly. There are many cottage industries in Varanasi and the famous industry is the industry of regional Banarsi Sarees production that is made from silk. The other industries are of handicrafts and the carpets. The production and weaving of Banarsi silk employed many people for generations. The cultivating of silk worms, processing the silk, weaving, dying, and completion of complete product takes substantial amount of time. The completed product however is transported to all over the world. Its demand is always high in the national and international market and sold at a very good price, hence the net profit is good. Special sarees, which have brocades with gold and silver thread works are often used during the weddings, Hence the demand in the wedding seasons are sky high. Recently the business has seen some downfall with the Chinese invasion in the market and the computerized designs. In industrial sector, the city has Diesel Locomotive Works, which employees many people. It produces the locomotives for the Indian Railways. Since there are still many parts and routes of the Indian Railway that are not yet made electric, Diesel Engines are used on these routes and hence, the production is still going on in the DLW. The locomotives are then sent to other parts of the nation as per requirements. Bharat Heavy Electricals Limited (BHEL), is the power equipment manufacturer and have manufacturing unit in the city. Its employees haul from every part of the world, and hence the city has diverse and multiethnic population. Other items produced here are copperwares, brassware, carpets, rugs, handicrafts, jewelry, musical instruments, etc. Some of the products are made here exclusively and has a great value and price in the market. With the presence of rivers like Ganga and Narmada, the soil of the city is very fertile for agriculture. The alluvial soil is the most fertile kind and the Ganga has deposited minerals in its basin over the period of time and hence, the farmers gets good crops every year. Major crops include wheat, rice, pulses, sugarcane, maize, vegetables, etc. The cultivation of mangoes is also prominent in the city. The large fields of mango trees yield large verities of mango, which is then transported all over the world. It is to be mentioned here that Banarasi paan (Betel Leaf) is famous all over the country. It is sold up to as high as Rs. 1200 per piece. Apart from these many un-organized household manufacturing units are present in the city, which has considerable contribution to the economy of the city. Utensils manufacturing, wooden and clays toys manufacturing, paintings, pottery, etc. are the un organized business which neither comes under a proper industry nor under the small-scale industry, but have a good contribution in the economy and employees people. The city is connected to well with the other major cities of the region and the country. It is accessible to all the part of the country. This makes its market even more approachable to the business persons and traders. The Lal bahadur Shastri International Airport, brings many tourists from international destinations. The railway line connects it to major cities like Delhi, Mumbai, Agra, Kolkata, etc., directly. Huge amount of passenger trains and cargo trains passes from the Varanasi Railway station. No Comment to " Banaras - Industrial Development Post Independence "